Bharti Recruitment Board of Indian Army will organize every year Indian Army Rally Bharti according to zone wise. 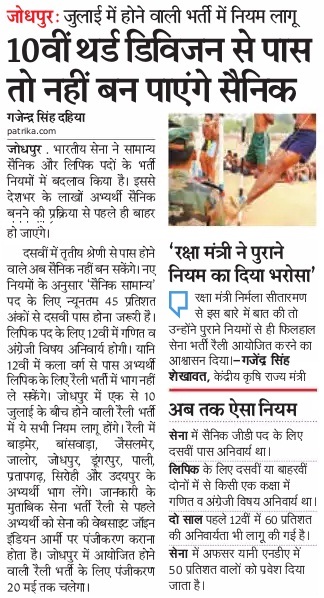 Candidates interested to join Indian Defense Forces are eligible to appear in Army Open Bharti Rally 2019. Indian Army invites online application form and conduct district wise rally. All candidates wish to became part of Indian Army and give his life in serving of our nation must appear in Army Open Rally Schedule Candidates you also have opportunity to became officer through ACC after joining the Indian army as soldier. Aspirants here is your opportunity to make your career in Indian Army, a life with discipline and unity. If you dream to live a life less ordinary must apply for Indian Army Khuli Bharti 2019. Indian Army is largest defence force of India works under Ministry of Defense will conduct open rally Bharti every year across India through bharti recruitment zone. Candidates appear in this open rally and give his full effort to clear all stages. Candidates prepare hard for Army Physical Test will be conducted by recruitment board. After that they will go for medical tests. Candidates as you know from this year Indian Army Recruitment Application Form will be fill through online mode, offline registration has been disabled now. Candidates you must aware that you can apply for one post at a time. All candidates must fill online application form for making registered themselves for Indian Army Open Rally Bharti 2019. Dear aspirants Big breaking news is coming about army recruitment process there will be written test will be conduct before physical ability test. After official announcement we interested to make aware to all seekers from this very important news. Candidates we provide these information after announcement by Indian Army Recruitment Zone Head Quarter. Soldier GD: Completed 10th from recognized Board/ School with minimum 50%. Army Technical : Candidates completed his 12th with Physics, Chemistry, Mathematics and English with minimum 45%. Soldier Clerk: Possess 12th Class Degree from Authorized Board/ School. Soldier Tradesman: Must Have 10th Pass from Recognized Board. Secondary & Higher Secondary Certificate/ Marks Sheet. Character Certificate under signed by Sarpanch. Note : Candidates are advised stay connected to this page for latest updates regarding the Indian Army Open Rally Bharti 2019-20, Army Rally Schedule Chart zone wise. Any Query Can be discussed through Comments.